Last night I experimented with a recipe I’ve been meaning to try but was a bit skeptical about – a Mac ‘N Cheese recipe that uses cauliflower and squash to amp up the health factor. Verdict: delicious! Hiding veggies in my meals is one of my favorite things to do these days. It’s a great way to get your veggies in if you’re someone like me, who is new to the whole idea of eating vegetables. It’s also a sneaky way to trick your children. I think a lot of kids would have no problem being tricked by this classic kid dish. Would I have been so easily duped as a child? No. But that’s because I wouldn’t even eat baked Mac ‘N Cheese. 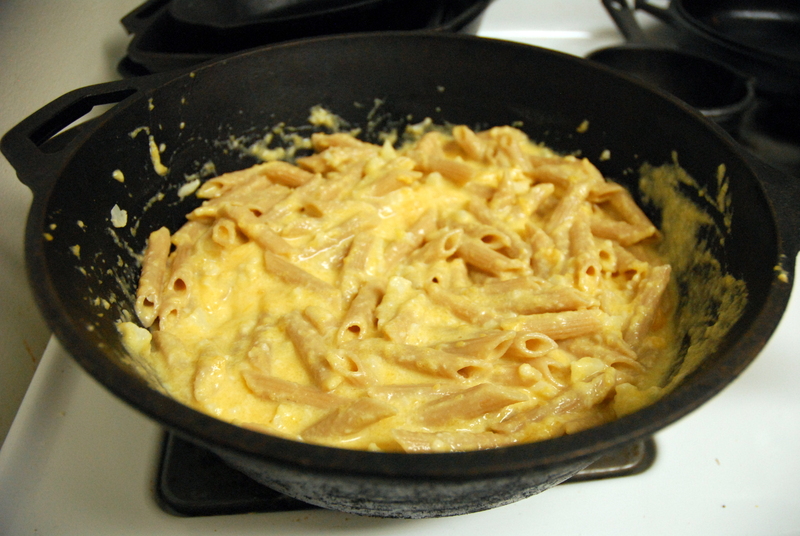 I would pretty much only eat Velveeta or Kraft – no gross homemade stuff for my former weird self! 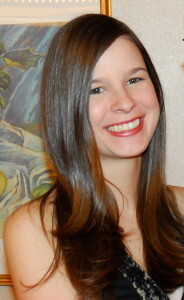 On a scale of pickiness, I was most definitely a 10. 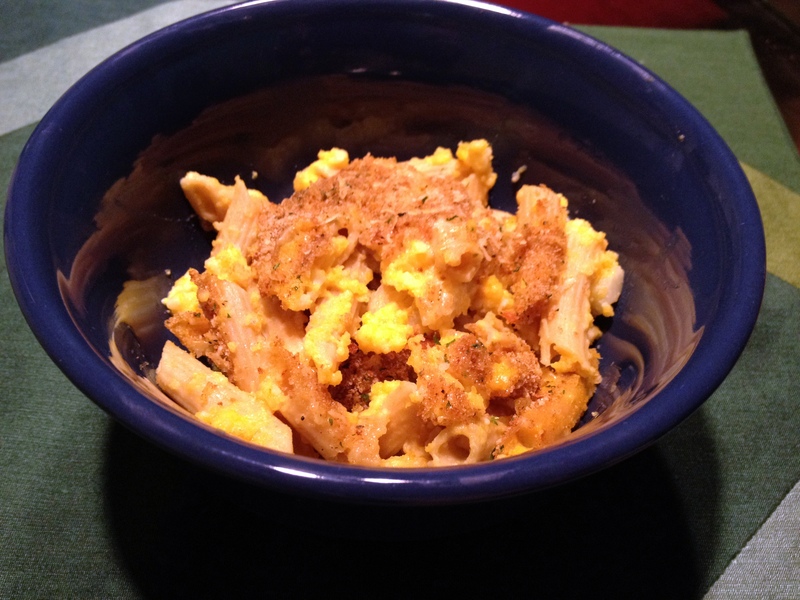 I think picky children below an 8 would be inclined to eat this Mac ‘N Cheese :). Apparently the idea of hiding vegetables in your child’s favorite foods is a controversial subject. NPR recently posted an article that discusses how children are willing to eat things like cake made with veggies, but many nutritionists argue that this is a bad thing for parents to do. Why? They say that kids need to learn to like eating vegetables as they are, not masked into cake or cheesy bite of macaroni. The article concludes, based on an experiment, that kids don’t mind if you tell them that the chocolate cake they just ate had zucchini in it, but they do mind you telling them that their cookie has chickpeas in it. It claims that kids were more averse to the unknown (chickpeas) than vegetables in general. I know that if my Mom had told me my cake had zucchini in it, I would have given it right back to her. No thanks. But if my Mom had been able to trick me, I would have been eating more veggies. So should you trick kids into eating veggies if you can? Or should you try to force them to like to eat their vegetables? Every one has their own opinion. Based on my experience, I think it’s a great idea to sneak veggies into your kid’s food, especially if they are extremely picky as I was and refuse to eat veggies. If you can get kids to like eating their veggies than props to you! But I think for most kids, it’s better to deceive them and thereby add some needed nutrients to their diets. If you’re intrigued and want to attempt this Mac ‘N Cheese with hidden veggies, it’s not too hard to do! First, chop up your squash. Then cook it in milk at a simmer for 25 minutes. While that’s cooking, chop up your cauliflower. Then throw it in with your pasta and cook according to package directions. 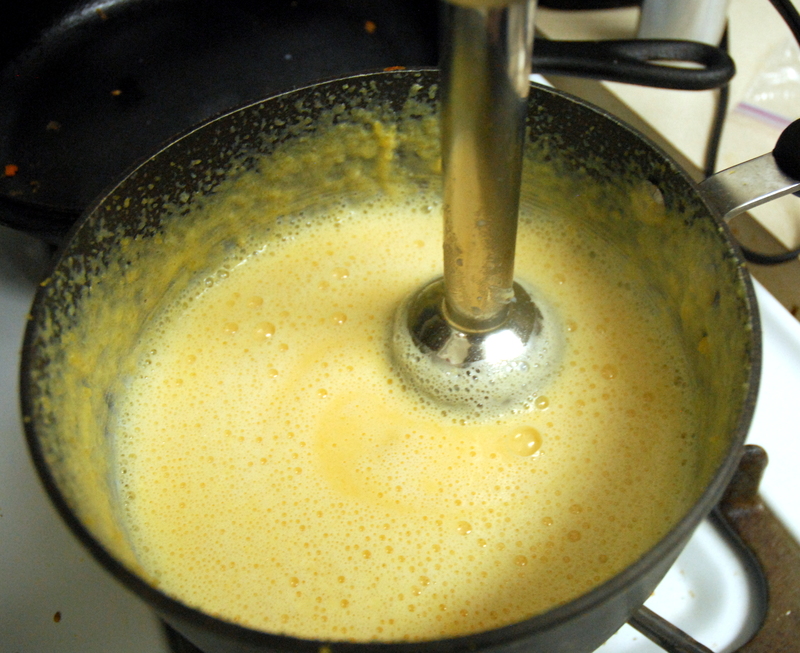 When the squash is cooked, use an immersion blender to combine the squash and milk. 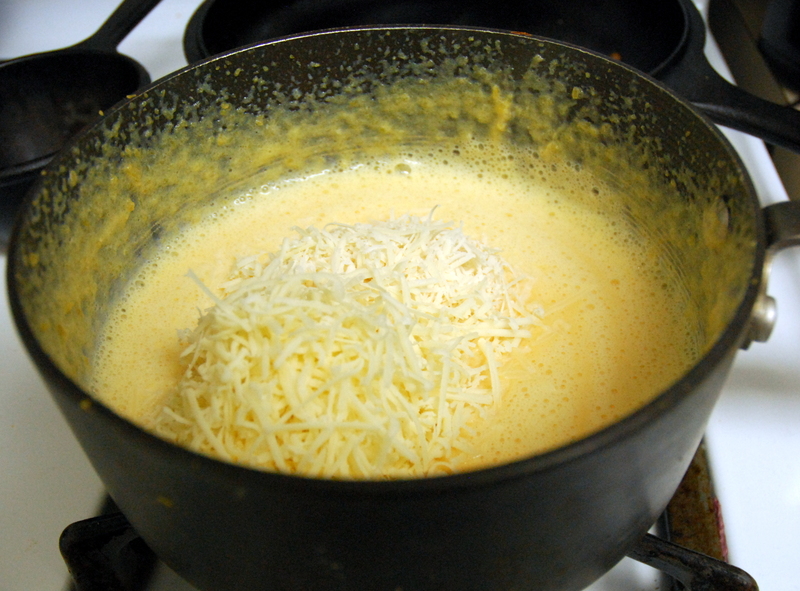 Then add your cheeses and salt and stir together to make the sauce. Drain the pasta and cauliflower and put it in an oven safe baking dish. 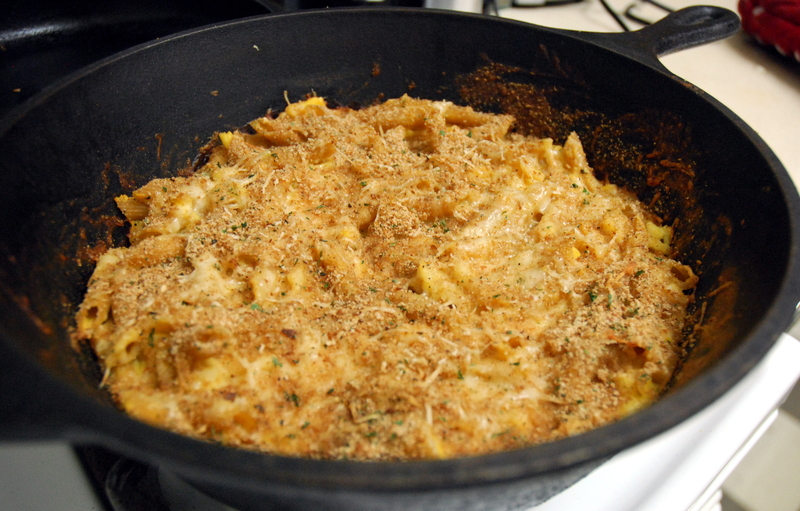 Top with breadcrumbs and a little more cheese and bake at 375 for 25 minutes. 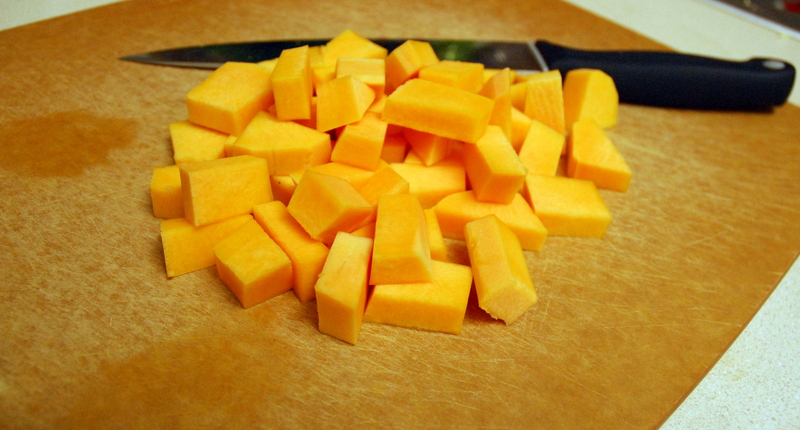 2) Chop up your squash. 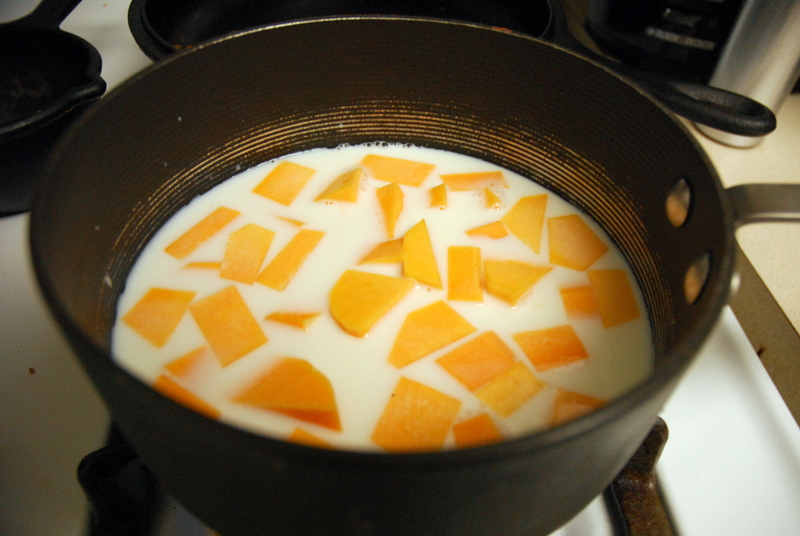 3) Add squash and milk to a saucepan and bring to a boil over medium high heat. Then reduce heat to low and simmer for 20-25 minutes, until squash is soft. 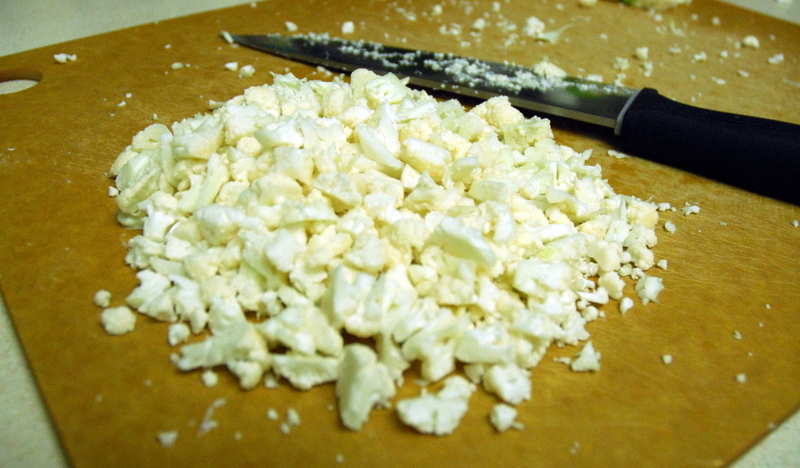 4) While squash is cooking, chop up your cauliflower. 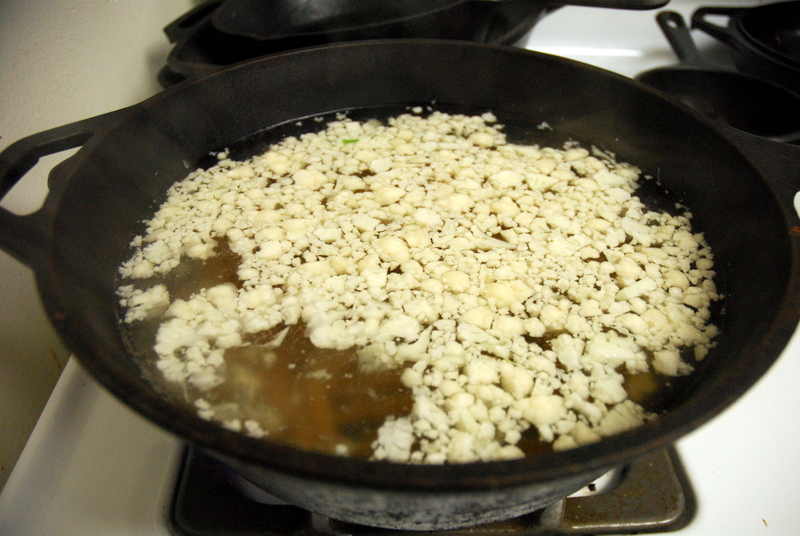 5) Add cauliflower to boiling water with pasta and cook according to pasta directions. 6) When squash is cooked, use an immersion blender to combine the squash and milk. 7) Add cheeses and salt to the squash mixture and stir until combined. 8) Drain your pasta and place in an oven safe baking dish. 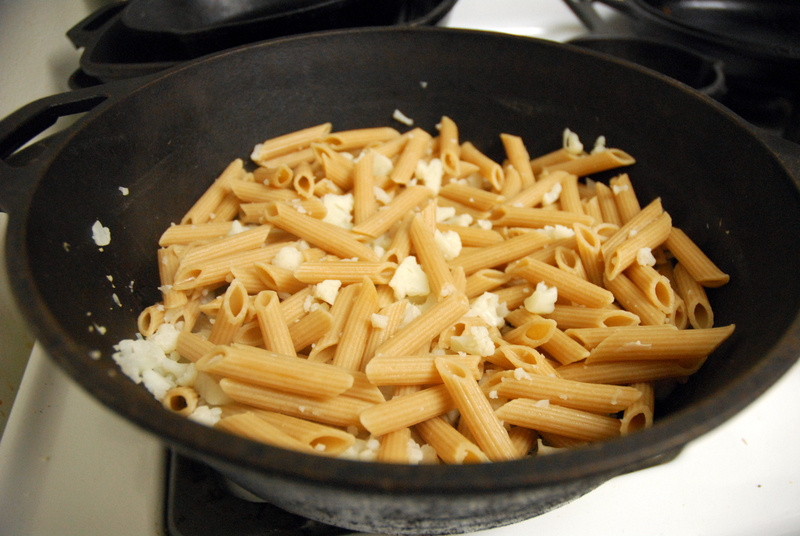 9) Add sauce to to pasta and stir to combine. 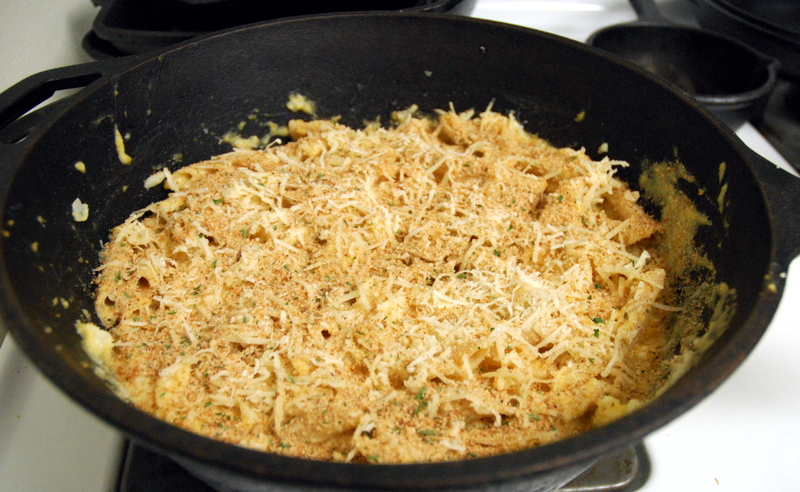 10) Top with breadcrumbs and a little more grated cheese. 11) Bake at 375 for 25 minutes or until cheese is golden and bubbly. This entry was posted in Food for Thought, Pasta, Recipes and tagged cauliflower, cheese, pasta, squash, veggies. Bookmark the permalink. 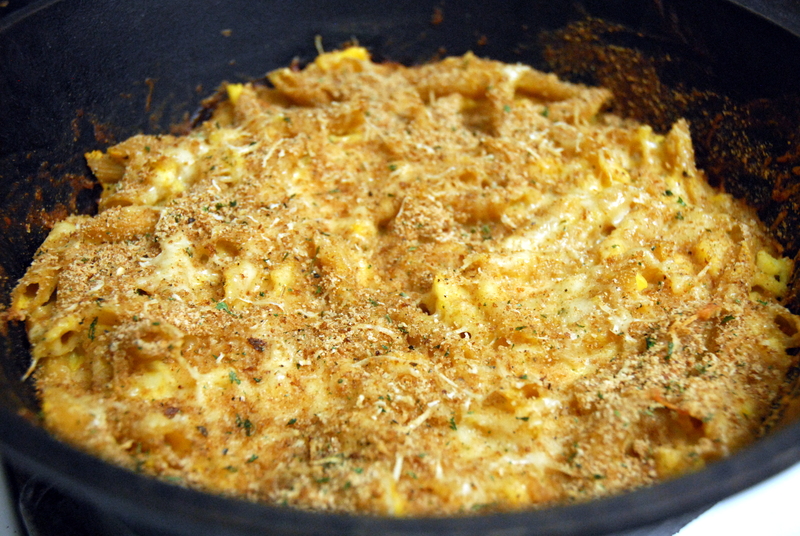 5 Responses to Mac ‘N Cheese with Hidden Veggies – Shhh! I don’t know if this is a great idea if your kids actually already eat vegetables but just argue about it. However, if you have a 10 as you put it like I do… We have tried absolutely everything to get her to eat fruits and vegetables but she will not! Not even not eat them but won’t touch them, look at them or put them in her mouth! We don’t really know why because as an infant she was a great eater and over time started eliminating foods from her diet!? She does eat broccoli but that is all and it is starting to show (complaints of stomach issues and fatigue that a 5 year old shouldn’t have). I’m going to try this but I don’t think she is going to fall for it.